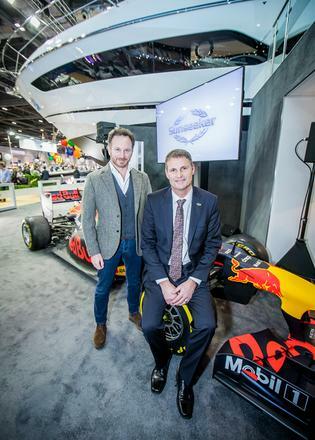 British yard Sunseeker International used the occasion of the 2018 London Boat Show to announce a new partnership with Red Bull Advanced Technologies that will see the two companies work together on a new range of yachts. Part of the Red Bull Technology group, which includes the Aston Martin Red Bull Racing Formula One team, Red Bull Advanced Technologies was established for exactly this reason — sharing technological breakthroughs from F1 with other related industries. Sunseeker CEO Phil Popham agreed that the partnership was a natural fit, due to the British yard’s reputation for performance. No further details have been released on the yachts that will benefit from this knowledge share, but the current Sunseeker collection ranges from 15 to 47 metres. This isn’t Sunseeker’s first F1 tie-up of course — Boat International columnist and racing aficionado Eddie Jordan has owned several Sunseeker yachts over the years, including the 155 Yacht Blush. In other Sunseeker news, the yard revealed earlier this week that it will be an official partner of the Fifa World Cup 2018. The announcement was made in the company of former England captain Sir Geoff Hurst and the replica Jules Rimet Trophy that will be awarded to the winning team in Russia this summer.